A reference set consisting of 300 click here for details on Accessions genetically most diverse accessions have been formed. This reference set captured 466 (95%) of the 490 composite collection alleles, representing diversity from the entire spectrum of composite collection. The reference set will be profiled with additional markers and extensively phenotyped for traits of economic importance to identify accessions for beneficial traits for utilization in groundnut breeding and genomics. 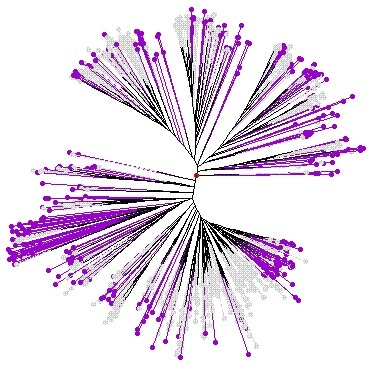 Tree diagram: Un-weighted neighbour- joining tree based on the simple matching dissimilarity matrix of 21 SSR markers across the 852 accessions of groundnut composite collection (Grey colour) with proposed reference set (300 accessions) in violet colour.